If you’ve had difficulty managing your learning management through Donesafe; don’t worry; it wasn’t just you. We’ve been getting requests for a while now to make learning management easier and this month: learning management got a lot of upgrades. There’s of course still more to do, but this represents the first iteration of this upgrade. Brand New Course Management module of courses and e-learning. 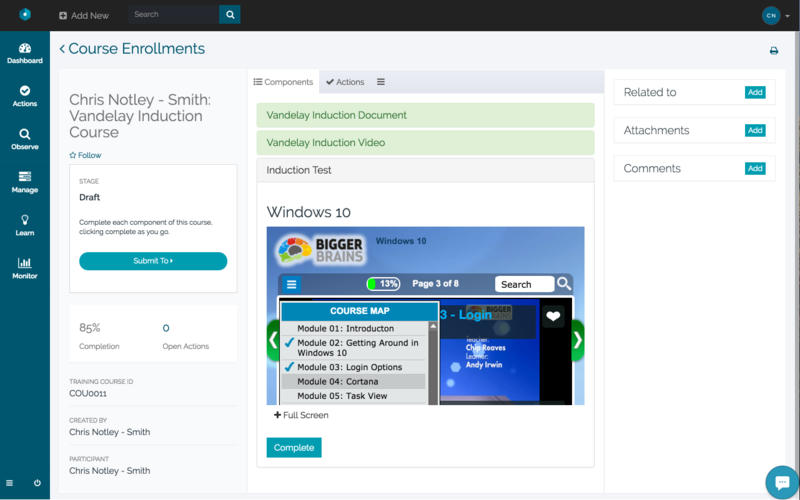 New automations for documents and courses to allow for auto enrolments, auto expiry notifications etc. Once we’ve covered the above we’ll also include some quick links to tutorial articles to help you configure and deploy these new tools. The new course management module is effectively an e-learning deployment tool. 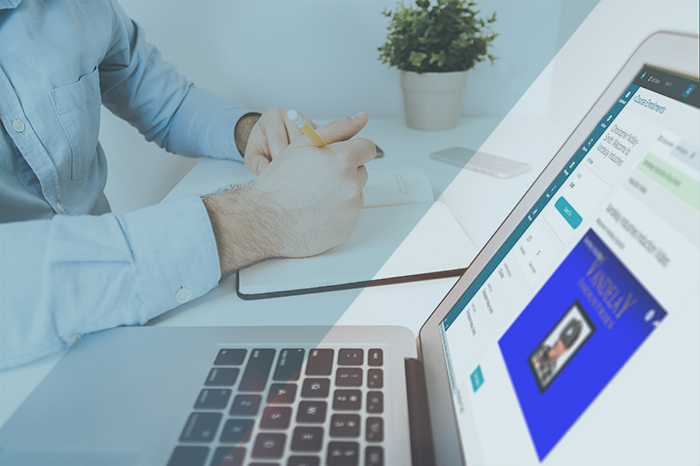 Using this module, Admins can set up multi-step courses using a combination of Video, Knowledge Base articles and SCORM courses. Each step can be applied its own score and deployed to team members to complete as necessary. 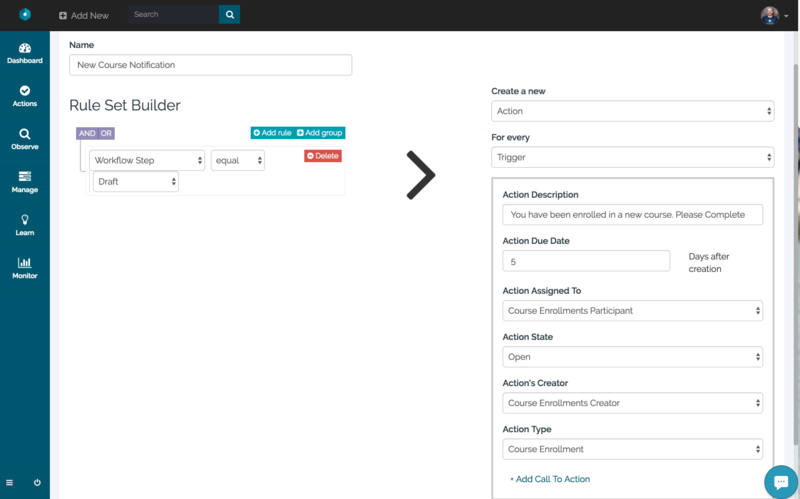 Courses can now be managed at a user-by-user level through their User profiles. From the User profile (Admins Only), you can now see a new ‘Course Enrolments’ tab where you can see, user-by-user what courses a user has been enrolled in and their completion rate. As an end user the new course enrollment module has something that the old one didn’t: It’s really obvious and easy to use. Each of the different course components show as collapsable windows where you as an admin can deploy as many knowledge base articles, videos or SCORM courses as needed. Watch the vid above to get a sense of how a course is completed (There’s no sound, it’s just me clicking buttons so you get a sense of the interface). Effectively, the user receives a notification, they head to the course, and work through each section as needed, clicking complete as they go. Every time the click complete, their completion score goes up (and that course component goes a nice ‘good-on-you’ green). As you can see in the video, the course I set up had three sections: a Knowledge Base article, a Video and a SCORM course. The knowledge base section simply pulls through your existing KB text and formatting. The Video plays simply and easily in the browser and the user can full screen if necessary. The SCORM course plays in the browser and now has full screen mode (which we couldn’t do before). Depending on the type of SCORM course, you can also pass through scores and have them automatically apply to the completion score. 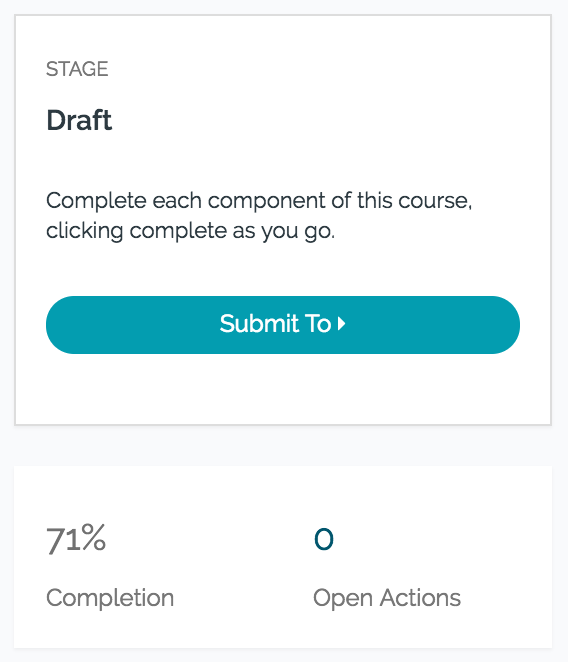 Once a course is complete, depending on your processes, the user can submit it to their manager for review if necessary, but in either case, that course completion will be recorded against their user profile. Later on we’re going to bringing in question templates with scoring also so look out for that. We’ll provide links on how to configure this module at the end of this section. Managing User Documents and User Courses. The other major benefit of the new Course Enrolments module, is that you can now take a user-by-user view of their courses. From the User Section you can now access a user’s profile (admin only) and from the Course Enrolments Tab see which courses they’re enrolled in, and whether they’ve completed it. Again, ‘courses’ refer to ‘e-learning’ as part of the new ‘Course Enrollment’ module discussed above; not documents like licenses and permits. For other types of documents, those can be managed from the Documents tab within the user profile. To add documents, just jump over to the Documents tab in the user section and click the add button. From there you can set expiry dates and such as you need. There will be updates coming to make some of this management a little quicker, such as quick adding courses right from this screen, but that will be coming a little later in the development of the Learning system. Exporting learning and document records using the report builder. For now, the quickest way of exporting these documents and learning records is using the report builder. Later we’ll be building exporters on the user record, but for now, if you do need to extract this data it can be done here. If you’re not familiar with the report builder, you can find instructions on how to activate it here, and the original release notes with some how to’s can be found here. But as an example, let’s say you wanted to extract the valid documents attributed to a user. 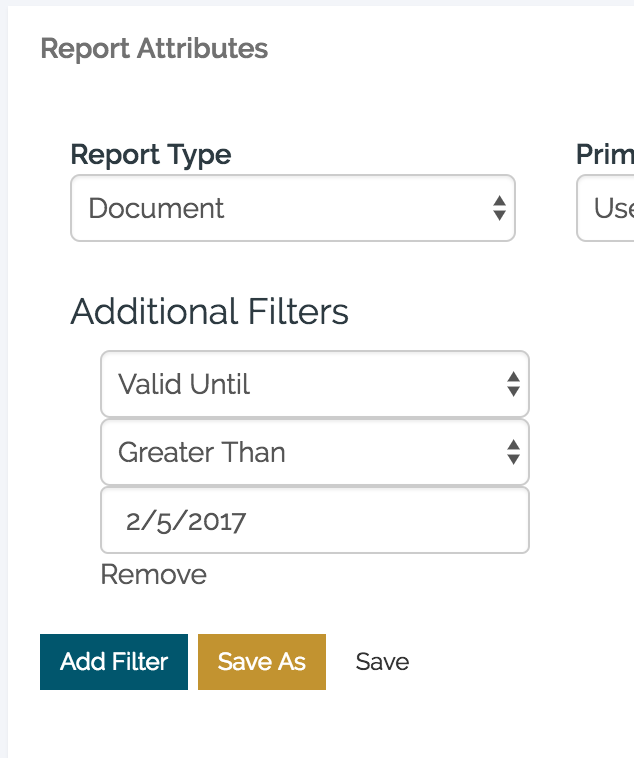 To do that you’d head to the Report Builder, select ‘Document’ as your report type, then add a filter “Valid Until” is “Greater Than” the current date. (by the way, you can save this report for later use, by first clicking [Show Report] and then clicking the [Save As] button). A report using these settings will show you all valid document records in your account. If you’d then like to filter it down to just a single user, click [Add filter], select ‘User’ as the filter. Then, click the search below to select or search for the user’s (or users’) records that you’d like to export and click [Show Report]. And there you go. Scrolling down the bottom of the page, you can now see all valid documents for that user which you can export to csv by clicking the [Export] button. 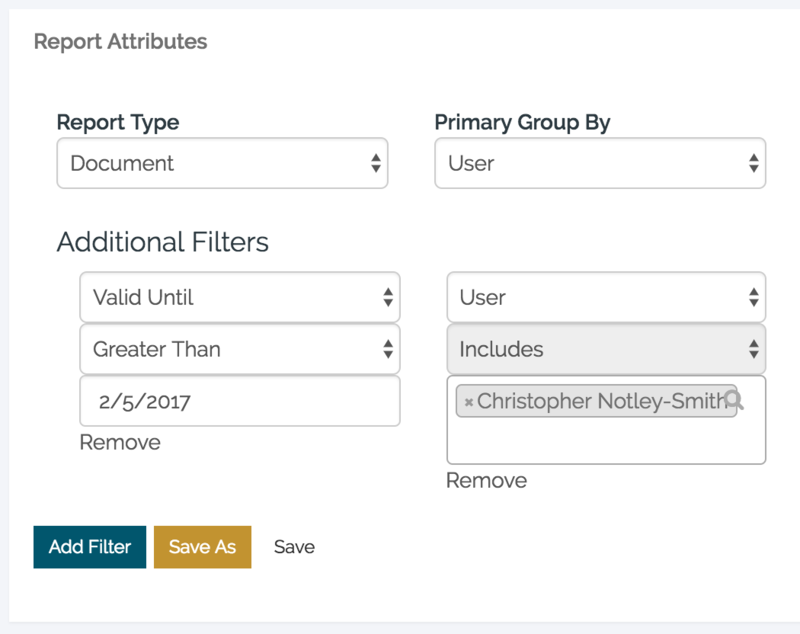 To do this with Course Enrolments, instead of choosing ‘Document’ as the report type, choose ‘Course Enrolment’ and apply the filters as needed. Once again, we’ll be bringing in quick exports at a later date, but for now if you do need to export user docs or course data you can do so using the report builder. Finally, there’s automations. In the long run we’ll be building some default automations for for learning and documents. At the moment they are some options available, but they’re still fairly basic, so in the meantime I’ll just say that more is coming. One that you might want to put in place straight away though would be to notify users when they’re assigned to a new course. As you can see, there’s quite a few steps to this new learning system, but as they say; to make an omelette you have to crack a few eggs. So over the next few months we’re going to be introducing some some new tools to make the new system quicker and easier to manage as well as linking up many of the parts discussed in this blog. There’s still a fair way to go; particularly around document management, but already though, you’ve got a muuuuuch slicker e-learning deployment tool and some much better management tools available to help you stay on top of your courses and learning. We’ve got plans already, but if you think of anything you’d love to see, don’t hesitate to leave a comment on this blog: don’t worry we read them all!